I don't know anything about art, but I know a little about Google. And I Googled this: Jeff Koons. 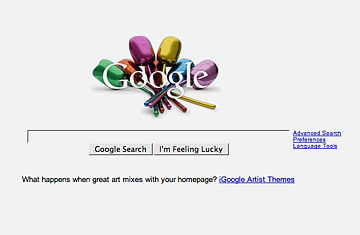 He's the artist whose "Chrome Tulips" decorated Google's minimalist search box yesterday morning. Lovely stuff. Beneath the empty box was a link to something called iGoogle Artist Themes ("What happens when great art mixes with your homepage?"). Users who clicked on the link got to choose from among 70 artists' "themes." From the likes of such commercial artists as Marc Ecko, Diane von Furstenberg, NIGO, Michael Graves and Dolce Gabbana, users could select a theme and personalize their iGoogle page, a place that Google dearly hopes will quickly become your start page. It seems pretty sweet. More free stuff from Google! And, by the way, raise your hand if you never used iGoogle or even knew it existed. You can think of iGoogle as part of the company's answer to Facebook. What Facebook did is known in the tech business as creating a "platform." It's a way for Facebook to make a marketplace that enables others to get rich  and the richer they get, the richer Facebook gets. There are many examples of platform building in Techland, but the most famous was Microsoft, whose Windows platform really took off with third-party software developers in 1987. Google, which makes its money on a free and open Web, was not happy with the Facebook platform. That's because what happens on Facebook stays on Facebook. Google would much prefer that you come out and play on its platform  the wide-open Web. Don't stay behind Facebook's closed doors! Hie thee to the Web and start searching for things. That's how Google makes its money. So, last fall, Google rallied all the other major social networks (MySpace, Bebo, Hi5 and so on) and announced a new initiative called OpenSocial. OpenSocial wants to be like Facebook's platform, only much bigger: Widget makers can write applications for it and they can run anywhere  on MySpace, Bebo and Google's own social network, Orkut, which is very big in Brazil. Google's platform could actually dwarf Facebook  if it ever gets off the ground. And for the record? I installed Adventure in Lollypop Land by Mark Frauenfelder on my iGoogle homepage. Weird  I never used iGoogle before.